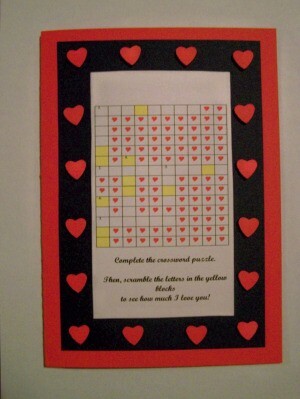 Create your own crossword puzzle to incorporate into a personal Valentine's Day card for a loved one. 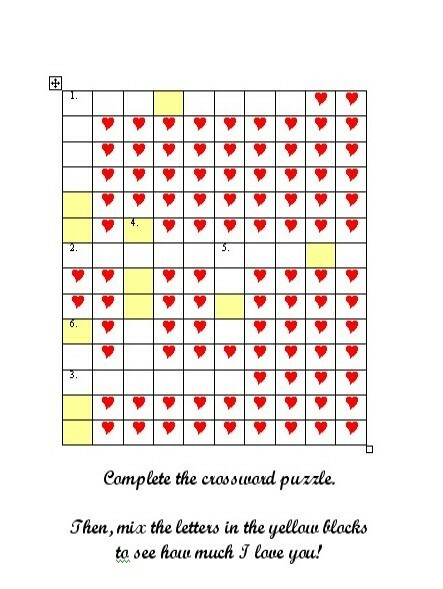 This is a guide about making a crossword puzzle Valentine's card. Make this card to show your sweetheart how much you love him. Either use the crossword puzzle that has been provided, or create your own crossword puzzle on your computer. If using your own crossword puzzle, print the puzzle on a sheet of ordinary white printer paper. Fold the red cardboard in half to create a card 5.7 inches x 8.1 inches ~ use a ruler to make the fold neat and smooth. Using the black cardboard, leaving a space of 0.6 inches from the outer edges of this piece, cut out the inside with the utility knife so that you will have a black "frame." Cut the crossword puzzle to the size 7.4 inches x 4.9 inches. Glue the crossword puzzle to the front of the card, carefully ensuring that it is an equal distance from the edges. "Frame" the crossword puzzle with the frame cut from the black cardboard. With the heart-shaped craft punch, punch out several hearts from the piece of red left-over cardboard. 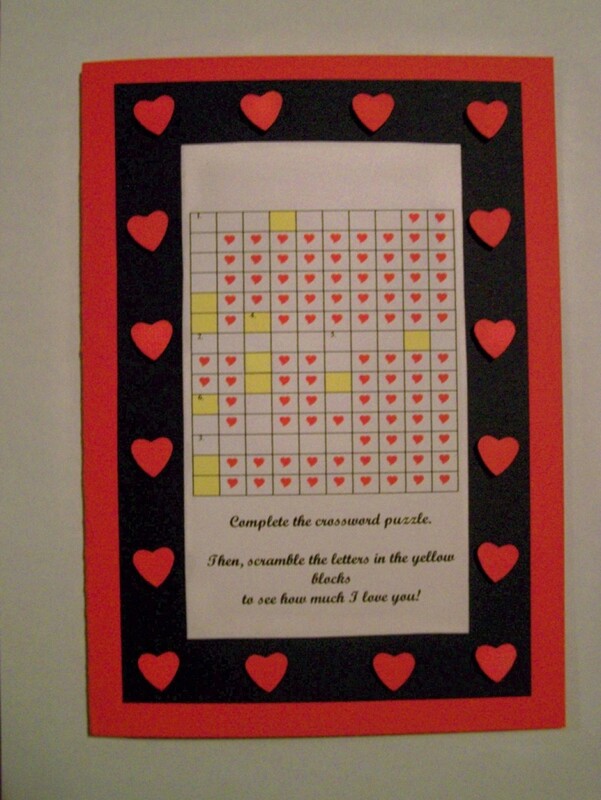 Using the 3D self-adhesive squares, glue the hearts on the black frame around the card, ensuring that they are evenly spaced around the crossword puzzle. If using your own crossword puzzle, print the clues to the crossword puzzle on a second sheet of ordinary printer paper. This must be handed to your loved one when giving him/her the card, as the idea is that your loved one must first solve the crossword puzzle before opening the card to read the message on the inside of the card. On Microsoft Word, choose the option Insert Word Art. Choose a suitable letter type and type the solution to the scrambled letters of the crossword puzzle (in this case: FOREVER MINE), and then print it on the third sheet of ordinary white printer paper. Cut it to the correct size and paste it to the inside of the card. Punch out a few more hearts with the heart-shaped craft punch and decorate the envelope. Remember to also add the clues for the crossword puzzle to the envelope when putting the card into the envelope! This building in India is widely considered as one of the most beautiful buildings in the world and stands as a symbol of eternal love. Usually, a loved one is showered with flowers and _____ on Valentine's Day. In the film adaptations of the Twilight novels, Robert Pattinson plays a vampire falling in live with a _____. This ship sank in 1912. It later featured as a movie with Leonardo diCaprio and Kate Winslet. Nat King Cole said, "When I fall in love, it will be _____." Valentine's Day commemorates this emotion. Shakespeare wrote about the love between _____ and Juliet.